Najponk trio is a swingin' unit based in Prague (Czech Republic) this acoustic piano trio (piano,bass,drums) comes directly from the roots of jazz (blues,swing,bop etc ) their repertoire consist standards from The Great American Songbook,tunes composed by the jazz Greats like Freddie Hubbard,Jimmy Smith,Dexter Gordon Miles Davis....played by their own way plus many Najponk's originals. 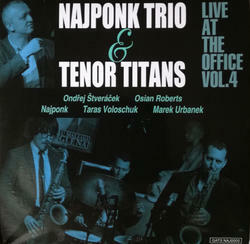 Najponk trio performed all over the world from Stockholm to Johannesburg, from London to Novosibirsk. Recorded live at Little Glen's October 5, 2016. Ondrej Stverackek -tenor sax, Oasian Roberts - tenor sax, Najponk - piano, Tara Voloschuk - bass, Marek Urbanek - drums.